Driving down the road no 28 from Nowy Sącz to Gorlice you pass through Szymbark. In the place you must turn right to "Heritage park in Szymbark" by indication of the signpost. After driving up to the end of the road, the manor is on the right, opposite to the heritage park. 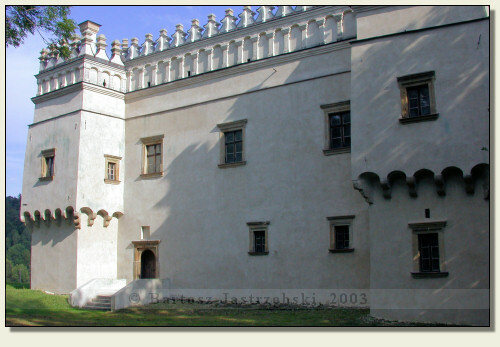 A defensive manor in Szymbark was raised around 1540 as the Gładysz family residence of Gryf coat of arms. It was built allegedly at the place of the earlier one, a wooden defensive foundation. Still in the XVIth cent. 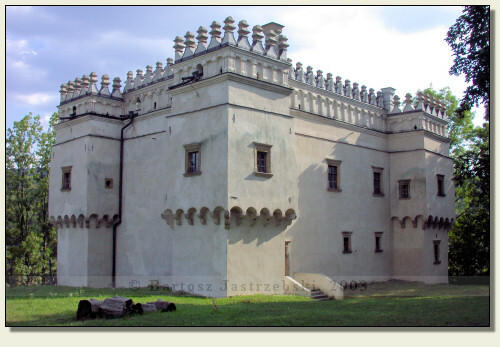 the manor was destroyed, and then reconstructed in a renaissance style, which we can watch at present. In the XVIIth cent. the building suffered destruction during the Swedish Deluge, in the XVIIIth cent. was abandoned, and in the XIXth cent. the building was designated for distillery. All of that led to a ruination of the manor, which was standing deserted till the middle of the XXth cent. The renovation works restored its former appearance and it houses a museum currently.